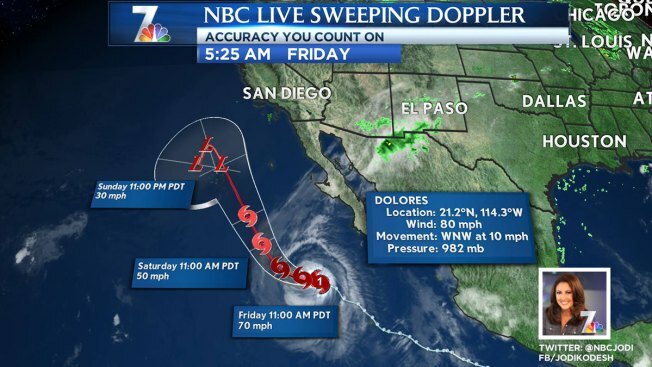 Hurricane Dolores will bring a swath of humid air and cloud coverage to Southern California this weekend. Saturday, it will be cloudy and feel muggy, but with much warmer temperatures. Coastlines will climb into the 80s, with inland areas into the 90s. Humidity will make it feel even warmer, and may increase the risk of heat related illness, primarily in the inland areas. We have a 30% chance of scattered showers and thunderstorms across the county, with a 50% chance in our local mountains. With the exception of a pop up thunderstorm, most rainfall totals will be below a tenth of an inch. A thunderstorm could produce heavier rainfall rates and runoff. Because of the chance along the coast, the National Weather Service has issued a Beach Hazards Statement for elevated surf, strong rip currents and the possibility of lightning strikes. Beachgoers are encouraged to swim near lifeguards, and be extra cautious of incoming storms. “Keep your eye to the sky. Head indoors, if thunder roars,” said Meteorologist Jodi Kodesh. It will be like this all weekend. We retain a slight chance of a shower or thunderstorm, Monday morning. Weather returns to a more normal pattern next Tuesday.